A combative, strong and quick openside, Phil Waugh was born in Sydney on September 22, 1979 and made his debut for Australia against England in Twickenham in 2000. Since then he has been a regular in Wallaby squads, noted for his ability at ruck time, his strength in the tackle and skill with ball in hand. He is somewhat unfortunate to have been born in the same generation as rival George Smith and the two have battled it out for the No.7 jersey for much of the last decade with Waugh winning 35 of his 79 caps off the bench, scoring four tries. Waugh attended Shore School in Sydney and captained Australia Schools in 1997 before going on to represent his country at Under 19 and Under 21, captaining the Under 21s in 1999. A year later he graduated to the first team and skippered Australia A against the British and Irish Lions in 2001. He won many plaudits playing for Super 12 side the Waratahs and claimed their Rookie of the Year award in 2000 before capturing the Player of the Year gong a year later. His progress was stilted in 2002 when an ankle injury ruled him out of the entire international season, but he more than made up for it in 2003. He played in 13 of the Wallabies 14 tests that season and coach Eddie Jones named him the side's vice captain for that year's World Cup, which took place on home soil. Waugh started the final against England, which Australia lost in extra time thanks to a Jonny Wilkinson drop goal. He won the John Eales award for the Wallabies' Best and Fairest Player at the end of that season and went on to partner Smith in a new look back row in the 2004 season playing 11 of Australia's 12 tests. In 2005 he won his 50th cap and he captained the side against Wales in spring 2006, but he was rotated with Smith for much of the season. Having been given the armband for the Waratahs for the 2007 season, Waugh was unfortunate to pick up a knee injury in Week 3 of the Super 14 season against the Cheetahs which limited him to four appearances that season. He recovered to captain his country against Wales and Fiji before playing in four of Australia's five World Cup matches before they were knocked out by England in the quarter finals in Marseilles. He again led the Waratahs in the 2008 season and skippered them to second spot in the Super 14, losing the final 20-12 to the Crusaders in Christchurch. 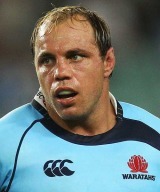 He holds the record for most Super 14 appearances for the club, surpassing Chris Whitaker's 107 in 2009. Waugh captained the Barbarians against Australia in his home town of Sydney on the June 6 2009. In June 2011, Waugh announced his retirement from the game following the Rugby World Cup.